H is starting to get interested in the World Cup. 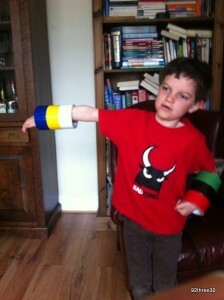 His school is planning a range of activities and projects to celebrate it. It’s a great way of encouraging children to learn about other countries and of course, if it fosters a love of sport too, that can only be a good thing. Duck Tape got in contact with me and suggested we work with them to mark the World Cup in a fun and crafty way, and H was very keen to get involved. 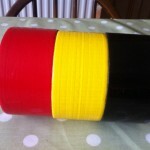 Duck Tape have sent us all the coloured tape colours that we need to create a flag of each country in our group. We are now in a sweepstake and whichever team wins the World Cup, the blogger with that team will win some of Duck Tape’s new, exciting patterned tapes. I’m not really expecting us to win as we haven’t got any of the favourites in our group. I think Belgium is the most fancied by the bookies from our teams, largely I understand because they are perceived to be in an easy group. We liked that we could make the Belgian and Russian flags from the rolls of tape themselves because they are simple tricolour flags. These were our two easiest flags to make and they were the ones we attempted first. We used the flag making session as a chance to practise H’s maths skills. I got him to work out how he was going to draw the guiding lines that we worked from and to do the sums needed to find where to draw. Then we added the Duck Tape to provide the coloured stripes. 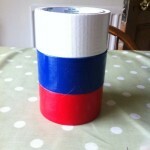 Here’s a picture of the two, but sadly H has the Russian flag upside down, making it look more like the Serbian flag. With the two easier flags under our belt, we decided to have a go at the harder too. Algerian was fairly straightforward. H got to work with his maths sums again to divide the card into two and we added a crescent moon and a star using a template. The Republic of Korea was something more of a challenge. I had to help out with drawing the yin-yang symbol. Then we had to add the trigrams (those are the black lines). They stand for sky, sun, moon and earth, plus they also represent the four cardinal compass directions, the seasons and members of the family. 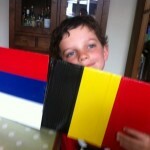 We’ve had a lot of fun taking part in the Duck Tape World Cup and we’ve learnt a lot about flags too. That South Korea flag is awesome! You did a great job! aaaa well done both of you, those flags look great, impressed with the smaller details!!! Great job on the flags. That looks like fun and looks like he did a very good job! The Republic of Korea flag looks very challenging. You’re right, the World Cup is great for teaching kids about other countries (and flags). My daughter has a World Cup sticker book and laps this sort of information up. great idea! i didn’t know duck tape came in such a range of colours. Never thought of using Duck Tape for crafts before. The flags look amazing – especially the South Korea one. Your flags came out great! 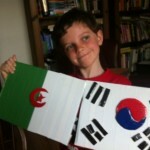 Those flags with details on like Algeria and Korea are not easy! Great idea. Well done for making those flags, they look complicated. Grace says – Lucas…………….. behave! great how we can include home learning and maths skills while they have fun. well done on actually making all 4 flags. Did you win? Elaine Livingstone recently posted..My Sunday photo.